Ever wondered about your pub's history? Mervyn Edwards has written potted histories of many North Staffordshire pubs, several of which are now on display on the premises. Perhaps your pub accommodated coroners' inquests, or staged entertainment in the 19th century. It may have been a coaching inn, or provided public dinners for civic dignitaries! Mervyn offers good rates for this service, and his history would occupy one sheet of A4 buff paper, suitable for framing by the pub landlord. Those landlords interested should contact Mervyn through this website. The Albert Inn in Liverpool Road opened as a beerhouse in 1861. It was advertised as being for sale in May of that year when the household furniture included a mahogany chest of drawers, two corner cupboards, six rush-seated chairs, two oak stands, a round table, a deal leaf table, an eight-day clock in an oak case, ditto in a mahogany case, an armchair, a rocking chair, three feather beds, bolsters and pillows, two sets of bedsteads, two tea trays, saucepans, iron pots, tea kettles and other articles. In February1862, landlord William Turner was summoned in connection with a breach of the Beer Act, having been found guilty of allowing two men to drink until 11.40 p.m. Turner was found playing cards with the men, who had a supply of ale on hand. However, relatively few complaints had been made about the running of the beerhouse, and so the Bench inflicted a nominal fine of 5s. with costs. The beerhouse was advertised as being for sale again in May 1862 when it was advertised as being attached to a brewhouse, a yard and other buildings. In February 1873, the local press reported on a case of "the use of obscene and abusive language" by a female customer named Elizabeth Simms, who had used provocative words whilst standing in the entrance to the beerhouse. At the annual licensing session at Newcastle in 1874, landlord Henry Mansfield applied for a spirit licence, reinforcing his case by telling the justices that he had drawn up plans for additions and improvements to the premises. However, he was refused. Mansfield applied for a full alehouse licence in 1878, enabling him to sell spirits. Supporting Mansfield was C. Smith (instructed by Mr Griffith) who told the justices that his client had kept the beerhouse for the last sixteen years and that the house was cleanly and well-conducted. There was stabling for two horses. It was claimed that there was a customer demand for wines and spirits at the Albert. The brewer, Henry Parker, the owner of the property, testified that he had bought the house for £980 and had spent £554 on improvements. This time, the licence was granted. Numerous public houses first operated as humble beerhouses, often run by enterprising individuals carrying on a secondary trade. This reduced the chances of insolvency. In 1862, James Hall, a cutler by profession, placed a notice in the local press that he had removed from High Street and was now based at the Castle Mona, in London Road. The premises at this time were often given the address of London Road, presumably to more easily identify their location. 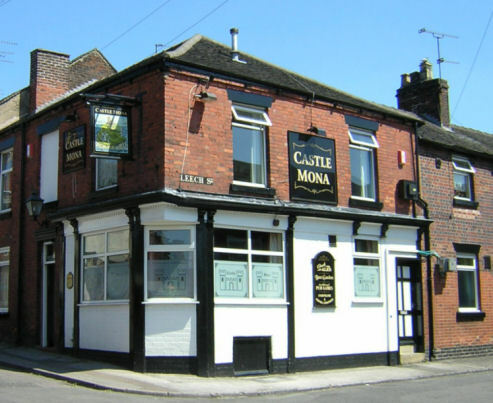 The Castle Mona beerhouse was advertised as being up for sale by auction in September, 1863. The furniture at this time included "a handsome 8-day clock in oak case, chest of drawers, four-post and tent bedsteads, feather and flock beds, straw mattress and bedding, round and square deal table, chimney and dressing glasses, time piece, fender and fire irons, brass candlesticks, bird and cage, cooking and kitchen utensils, and other effects. Also sign and name board, drinking screens and brass taps." Shop fixtures, stock-in-trade and the premises' working plant - which included a small steam engine and boiler, an anvil, a vice and other tools remind us that Mr. Hall was first and foremost a tradesman by profession. By November, Mr. Hall gave notice of his removal from the Castle Mona to premises at the top of High Street, next door to Mr. Franck, an optician. "The premises contain front shop with plate glass window, parlour, bar, and bar parlour, tap-room, scullery with iron pump and a plentiful supply of water, cellar, good yard, and cutler's shop, which may be readily converted into a butcher's shop or a workshop for an artificer. There are also two good bedrooms, and clothes closet, and large club-room. The house is fitted up with good grates, iron washing furnace, and gas, and is well adapted for any business, requiring space, is situated in a respectable neighbourhood, where a good class of houses are constantly in course of erection." The same notice appeared in the press in March, 1864, ultimately being taken on by William Audley. He had been listed in Kelly's trade directory (1860) as an auctioneer, appraiser, house and estate agent, with offices at Pepper Street in Newcastle as well as at Stone and Hanley. William Audley lost no time in announcing his arrival as Mr. Hall's successor at the Castle Mona, advertising his "First-class ales, porter, and cider, cigars, tobacco, and good accommodation" in a local newspaper. Unfortunately, he fell foul of the sessions of the Borough petty sessions in 1865, having to plead guilty to the charge of having his house open for the sale of beer during prohibited hours on a Sunday. He was duly fined. In September, 1868, it was announced that Mr. J. Pilsbury had been granted a license at the Castle Mona. John Pilsbury, born in Newcastle, was keeping the Castle Mona at the time of the 1871 census, when he was listed as a butcher and an innkeeper. Sarah Leigh is mentioned in the census, listed as a "butcher's apprentice." John, "Castle Mona, & butcher" was listed in Kelly's directory of 1872, but by August of that year, the household furniture, butcher's utensils and stock-in-hand on the premises were up for sale, the press advertisement being pitched at "butchers, publicans and others." Items included a spring cart, butcher's block, scales and weights, and a cleaver. By 1880, the beerhouse was occupied by the Meadon family and they are recorded as being in residence in the 1881 census. By the time of the 1891 census, Edward Starkey and his family kept the Castle Mona. He is listed, rather loftily, as a brewer's manager, whilst a trade directory of 1892 describes him as a publican. The property, in St John's Square, is referred to in sales particulars in the Staffordshire Mercury newspaper of 1847 as a Lot that was held under a lease for 999 years, dating from 16th October, 1709. The licensee in 1818 was Hannah Sheldon, victualler, but Mary Stanyer is listed as keeping the Duke William in Pigot's trade directory of 1835 and Williams (1846). In that year, Mary, the tenant, announced in the press that she was retiring from business, and the public house was advertised as being to let. At this time, the Duke William had a brew-house, stabling and other offices attached. It was advertised as being for sale by auction in 1847, and having a frontage of 31 feet to the Market Place, St John's Square, and 25 feet to Newcastle Street. Arthur James Robinson is mentioned as the landlord in 1887, when a disturbance took place in the Duke William. He was assaulted by two other men following an argument about dog-racing. Among the groups and associations that met at the inn were the Burslem Lodge of Overnmen, Kilnmen and Saggar makers who were certainly holding Saturday evening meetings there in 1882. 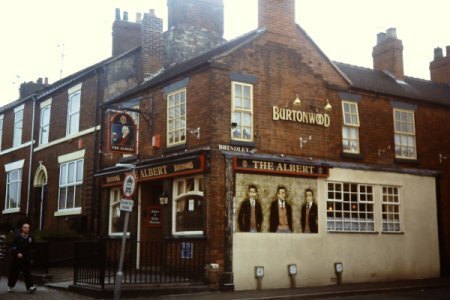 In 1884, proprietor A. J. Robinson was advertising Burton ales, wines and spirits as well as entertainment. A free and easy took place on Saturday and Monday evenings and a pianist, Mr L. Toft, was employed for these occasions. Evidently, these events proved successful, as an advert in the Staffordshire Sentinel in 1887 declared, "Wanted. Everybody to hear the fine talent engaged nightly at the Duke William Music Hall, Burslem." "There were, as usual, several loafers at the top of the square, in the corner between the bank and the 'Marquis of Granby' and one of the loafers stepped forward and shook hands with an obviously willing Maggie." A photograph survives of the St John's Square at this time (circa 1908), and the inn is shown as yet bereft of its present mock Tudor frontage, probably added in the 1930s. The Duke William was often patronised by artist and playwright Arthur Berry (1925-1994) in the early 1980s. 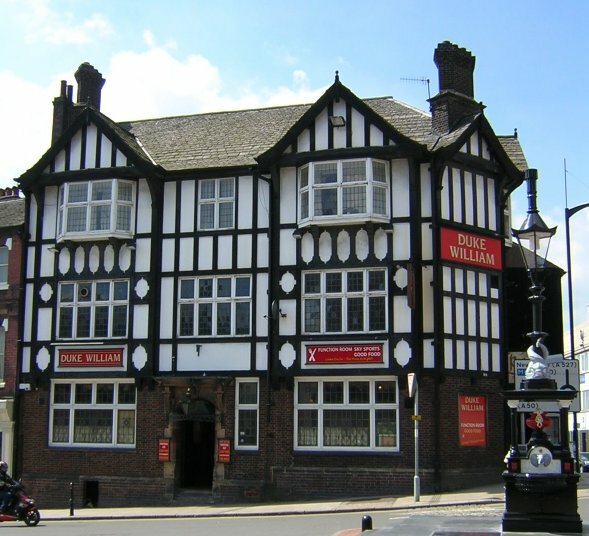 In January, 2010, The Sentinel announced that Mark Aston, the landlord of the nearby Post Office Vaults, would be re-opening the renovated Duke William in the spring. 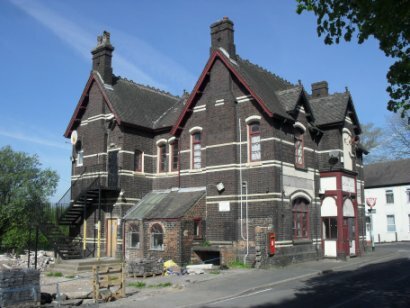 The Duke William is one of only three Potteries pubs listed in Britain's Best Real Heritage Pubs (2013) by Geoff Brandwood. The entry reads, "Rebuilt c. 1930 and pretty much intact. Fine glazed screenwork in lobby bar." This pub has the honour of being mentioned in the first-ever edition of the Staffordshire Sentinel newspaper, on January 7th, 1854, when a "Sale at the Mear, near Longton" saw farming stock being advertised in a forthcoming auction at Mr. Joseph Bennett's Saracen's Head. However, the Saracen's Head merits an entry in this book not through the endeavours of Mr. Bennett, but on account of the quirky architectural style of the rebuilt hostelry. The 1925 Ordnance Survey map shows the King's Arms and the Saracen's Head facing each other across Meir crossroads. Both pubs were rebuilt by John Joule and Sons - the former in 1935, on the same site. The Saracen's Head was reconstructed about a mile away, higher up Sandon Road. Meir saw several major changes in the 1930s, and the rebuilding of the new Saracen's Head - which opened in 1934 - was both a part and a consequence of the changes. The rebuilding occurred soon after the arrival of a new housing estate and the establishment of Meir Aerodrome. The new pub was intended to draw custom from both. From a broader perspective, it emerged as part of efforts to provide more respectable, comfortable and commodious pubs, with the Public House Improvement Bill being passed in 1924. The new pub was one of the growing number of hostelries built to serve car-borne patrons. Set back from the main road, it offered ample space for cars and coaches, to its front and rear. It was one of the so-called 1930s "road houses" in the Potteries among which we might also include the Victoria at Baddeley Green. Built on a lavish scale, the design was described as having "something of a Tudor appearance" about it. Although this aspect is not as blatant as numerous other examples of 1930s "Brewers' Tudor" - such as the Duke William in Burslem and the Bull's Head at Hanford - it nevertheless fell into line with a fad for building Elizabethan-style pubs that was at its apotheosis in the Thirties. The architecture of the pub was intended to blend well with the style of the Corporation houses in its vicinity. It boasted tall chimney stacks and rustic brickwork, with which artificial stone dressing was incorporated. The roof was covered with Westmorland and multi-coloured slates. The rear of the pub embraced a balcony that overlooked Meir Aerodrome and the countryside beyond. The interior rooms were airy and spacious, incorporating fine oak timber. There was a bar, a smoke-room and a lounge with oak-panelled walls and a Tudor-style brick fireplace. The upstairs function room could accommodate 200 people, whether for meetings or dances. The architect of the building was Mr. J. S. Redman of Stone, and the builder and general contractor was Mr. J. Walters, jun., of Longton, who had erected other hotels for the brewery. The Saracen's Head has become all the more valuable as a landmark in Meir, since the insensitive demolition of the spectacular King's Arms pub in 2008. The present pub is a reincarnation of a former hostelry of the same name. When landlord George Wilshaw appeared before the magistrates in 1873 on a charge of being drunk and riotous and with permitting drunkenness in his house, it was stated that he had kept the Trent Tavern for 26 years, without a complaint made against him. However, this is not to say that the pub was always free of trouble. In 1864, two customers, George Moore and Thomas Rhead also found themselves before the magistrates for an ugly incident in which Moore struck Rhead in the face and kicked his dog. The stipendiary dismissed the case as a "public house squabble." Many of the coroners' inquests that took place at the Trent Tavern involved fatalities in the local pits. In 1872, John Jones, a collier at the Hanley and Bucknall Coal Company, was buried beneath debris. In 1873, Charles Beardmore died in a shaft accident at the Co-operative Coal Supply Company's Blakelow Colliery. Thomas Jones also died in a shaft accident at Mossfield Colliery in 1874. In the same year, Herbert Ridge died in a roof-fall at the No. 2 pit of the Lawn Colliery, Bucknall. William Adams, collier, died at the Berry Hill Colliery in 1919, again as a result of a roof-fall involving 15 cwt of coal. In each of the afore-mentioned cases, the coroner returned verdicts of "accidental death" underlining the routine disregard by private companies for the safety and welfare of their employees. Customers were able to transfer their allegiance from the old Trent Tavern to the new one in double-quick time. At 10.00 p.m. on April 12th, 1960, the old pub, with its small rooms - described as being "just a few yards on the Longton side of the River Trent" - closed its doors for the final time. The very next day, the new Trent Tavern - built a short distance away - opened at 6.00 p.m. Why did Worthington and Company rebuild and re-locate the pub? They explained at the time that it was hemmed in by other properties, had no garden and no space to park a car. Not only that, but it was "situated on one of the most complex road junctions in Stoke-on-Trent." This type of pub was no longer wanted in the 1960s, according to the breweries. The company declared, "A car park is essential for a public house these days." The new pub stood in an acre of ground, had a garden and terrace to the rear and parking spaces for 46 cars. It could boast of two main rooms, a lounge and public bar. The pub sold beers from Bass, Ratcliffe and Gretton Limited as well as those of Worthington and Company. The architects for the new Trent Tavern were Messrs. Forshaw, Greaves and Partners of Newcastle, who were responsible for the Lambourne in Blurton (also 1960) and several other new pubs in the area. In common with numerous pubs across the country, the Cottage began as a beerhouse. Though these were often precarious retail outlets in terms of sustainability, it is clear that the Cottage was one of the more flourishing ones - as was revealed in matters discussed by the Pirehill North Adjourned Licensing Meeting in 1874. There, a Mr. Ackrill applied, on behalf of Reginald Young, for a spirit license for the Cottage Inn beerhouse, at which time the present building was in course of construction. Ackrill stated that "Tunstall had fewer licensed houses than any other town of its size, there being 14,000 inhabitants and only 10 licensed houses. Then all these licensed houses were on the opposite side of the town to that on which the Cottage Inn was situated. A public house was required in the neighbourhood; the new premises would be in every way suitable, and would prove an ornament to the town. Mr. Smith, barrister, opposed the application, but the magistrates granted the license, on the distinct understanding that the new and old houses would not be used at the same time, but that when the new premises were completed the old house would be taken down." Other neighbouring competitors perhaps feared for their own profits, with the imminent rebuilding of the Cottage. At this time, Mr. Smith applied for a spirit license on behalf of Joseph Elkin, the landlord of the Dog beerhouse, opposite to the Cottage Inn. It was refused. The new hostelry (the date of 1875 can be seen on its frontage) was well positioned to serve those who worked in local industries. A coroner's inquest took place at the Cottage in 1876 following the death of a collier who had been buried beneath two tons of overburden in a roof fall at the Peacock's Hay Colliery. A subsequent coroner's inquest in 1877 was held in connection with the deaths of 11 men in a terrible boiler explosion at Heath and Sons' Ravensdale Ironworks whilst another inquest touched on the death of Thomas Jones, an ostler at Goldendale Ironworks, who died in 1879. Unsurprisingly, meetings of the local workforce were numerous at the new hostelry, expecially as the fluctuating local economy engendered tension between men and masters in the local indusries. The issues of wages and working conditions were often debated and Enoch Edwards (1852-1912) a trades unionist and treasurer of the North Staffordshire Miners' Association by 1875 (he was general secretary by 1878) was no stranger to the premises. Miners' meetings didn't just take place inside the pub, either, for we read that at the time of the miners' strike in 1883, Mr. Pickard (a miners' representative from South Yorkshire) addressed a large meeting of miners "in the yard of the Cottage Hotel", whilst Edwards also delivered a "stirring address". Miners from Cheshire, Lancashire and elsewhere attended meetings at the Cottage. The Cottage is presently closed. The history of this public house has its origins in the growth of Burslem and Longport following the completion of the Trent and Mersey Canal in 1777. Charles Barker, a local shoemaker (he is listed in Parsons & Bradshaw's 1818 Directory) had a three-sided square of industrial workers' housing built, just below the Church Cottages. Dating this development is difficult, although Barker's Square does appear on the 1822 Map of the Parish of Wolstanton, and the building which eventually became the Archer public house is reckoned to date back to circa 1800/1810. Barker's Square became inhabited mainly by potters and tradesmen working in and around Burslem. There is no reference to a beerhouse in the Square in the 1841 census, nor in 1843, when seven dwelling houses in the Square were up for auction. However, auction particulars in 1857 reveal that the New Inn beerhouse was occupied by Henry Hackney. Sarah Gettring is listed in Kelly's Directory of 1860 as "beer retailer, Church Street", and in the 1861 census for Barker's Square she is recorded as being age 53, born in Chell, and keeping a beerhouse. In 1882, auction particulars indicate that the New Inn beerhouse was "To let... with large yard, stable and piggeries; rent £25." 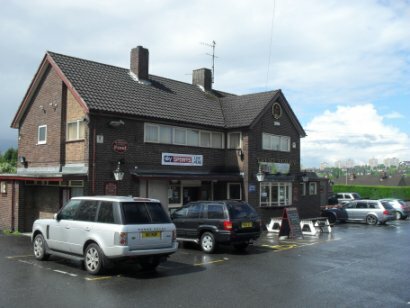 The New Inn was used by patrons of the adjacent Marshlands Picture Hall (1911-1960) and by miners from the nearby Wolstanton Colliery (closed 1985). Pub regulars raised money for the North Staffs Licensed Victuallers' efforts for prisoners of war during World War II and in 1951, members of May Bank British Legion held meetings at the pub, whilst more permanent headquarters were being considered. At some stage subsequently, the pub was renamed the Archer. The building was recommended for Grade 3 Listed status circa 1970, its Georgian-style portico being considered particularly of interest. However, listing status does not appear ever to have been granted, and the old Grade 3 designation was later dropped by English Heritage. Former Wolstanton Colliery miner Tim Pattison remembers the pub in the 1970s: "On a Sunday, when it was 2.00 p.m. closing time, I knew miners who would finish at the pit at 1.45 p.m., throw off their helmets and respirators, sprint up the bank to the Archer, and have four or five pints before going back down to the Pithead Baths, showering, and THEN going home!" The Archer was last refurbished by Ansells in August/September 1992, but was not altered structurally. The room overlooking Church Lane was ultimately occupied by a pool table, (formerly located in the upper section of the pub). A pigeon club's purpose-built structure stood at the rear of the pub, the club itself transferring to headquarters elsewhere, following the threat to the Archer's future which led to the Save The Archer campaign being established in February 1997. The Friends of The Archer (Spokesman: Terry Fitzmaurice) were able to secure the building's future by persuading Newcastle Borough Council to extend the Wolstanton Conservation Area to include the structure. However, Allied Domecq were determined to sell off the pub, and the licensee Pam Leigh closed the Archer on Friday, March 13 1998. A private party took place on the following night, attended by invited guests who were deemed by Pam to have been regular patrons of the pub. She remained in residence until May 13, departing afterwards to run the Lamb in Stoke Prior, Leominster. The Archer was boarded up and all exterior signage removed on May 21. The purchasers of the building, the Roman Catholic Church, demolished the old pigeon club hut to improve access to St. Wulstan's church and parish hall. The building's white exterior survived until June 2000, when the owners re-painted it in the colour of burgundy. 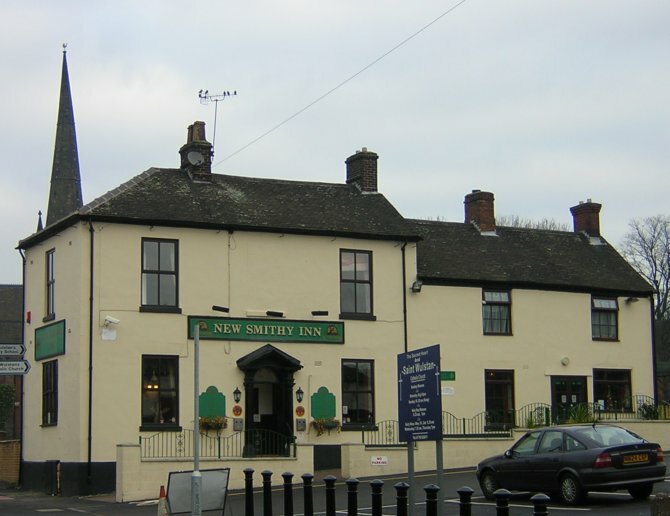 With its exterior newly-painted off-white, the pub, incorporating structural alterations, reopened as the New Smithy Inn on June 21 2001. The premises were erected - probably in the late 1850s - by James Miller, in response to the growth of new housing in the vicinity of King Street and possibly in order to attract railway travellers from the new Newcastle station in King Street. The Victoria was certainly trading as a beerhouse in 1860, as the local press reported on a case of an assault on the premises in June. The assault had been triggered by a dispute involving the playing of cards for ale. Witnesses deposed that a large company was playing, and that a "dozen gallons" of ale were brought in to them. The landlord at the time was John Spencer Graham. The 1861 census lists Thomas Black, "tailor and beerhouse keeper" as running the Victoria. It was Thomas Black - the occupier for nine months - who applied for a spirit license at the annual licensing meeting for Newcastle, in September, 1861. This application was opposed on behalf of Mrs. Webb, of the nearby Borough Arms Hotel. Mr. Winstanley, representing Mr. Black, stated the case that within the past seven or eight years, 400-500 houses had been erected in the vicinity of the Victoria. Mr. Black's house, at that time, contained five rooms on the ground floor, a large yard, a good coach-house with an entrance into Miller Street, stabling for three horses and a brewhouse. On the chamber floor, there were seven bedrooms, one of them designated a club room. The licensing magistrates were presented with two separate memorials supporting the application, signed by 58 and 78 names respectively. Among the signatories were the occupiers of Basford Hall and Stonyfields, doctors of medicine, a churchwarden and the High Constable of the Borough. Another supporter was Samuel Hyslop, draper, a future proprietor of the Borough Arms Hotel. The application for a spirit license was made on the grounds that excisable liquors were often required in cases of sickness, in which case residents of the new neighbourhood were forced to walk a greater distance to the nearest public house, the Borough Arms Hotel. It was also stated that the Victoria accommodated a different class of customers - i.e., workmen - than the Borough Arms, which was of superior character. Thomas Black himself reasoned that visitors from as far afield as Leek had often inquired about the availability of spirits. They often left their horses with him prior to going into the town of Newcastle. Mr. Miller stated that he had spent about £600 on the premises, whose present rental of £28 would be increased if he were to secure a spirit license. The application, however, was refused on the grounds that the existing licenses were sufficient for the town. By the time Mr. John Edwards, the then-keeper of the Victoria, applied for a spirit license in 1864, Mr. Knight, again opposing on behalf of the Borough Arms referred to the application as "a sort of annual thing," and that he had opposed it for "seven or eight years." On this occasion, the magistrates granted the spirit license on the proviso that necessary alterations were made to the accommodation. Edwards subsequently converted his club room into two permanent bedrooms, to the satisfaction of the Borough Surveyor. The license was transferred from the late Mr. J. Edwards to his widow in 1867 but the enterprise of Henry Bradbury, described in October, 1867 as "commission agent, &c." at the Victoria Inn triggered a period of real prosperity. He began to aggressively advertise the premises as being a short distance away from the railway station, promoting its wines and spirits, ales, porter, cider, its food operation and its well-furnished apartments and beds. An ordinary (a meal provided at a fixed time and price) was often advertised, as was the Victoria Inn supper, on Christmas Eve and New Year's Eve, 1869. The food included roast beef, roast turkey, tripe, jugged hare and goose. The advertisements for the Victoria Suppers solicited the "company of any Gentleman," suggesting that the premises was now attracting a superior clientele than it had at the outset. Henry Bradbury's skill as a caterer led to his being appointed by the Corporation to provide refreshments at the Newcastle Smithfield Whitsun Fair in May, 1871. By July, he was advertising his "Carlsberg beer, brewed on the Australian principle by Jacobsen, Copenhagen, also Bass's Pale Ale and D'Arcy's Dublin Stout." Unfortunately, in the same month, the popularity of the pub got out of hand. The local press reported on anti-social behaviour caused by "a party of tailors on the spree" in 1871. In November, 1871, Mr. Bradbury died suddenly and the license was subsequently transferred to David Parkinson Norton. It continued to serve the community well, with coroner's inquests and sales of land being held there in the 1870s. Mr. Norton removed to the Vaults, in Red Lion Square, in 1875. In more recent times, Clive Hutter, a Somerset man, is remembered as a publican in the 1980s as is the fish tank that he kept in the lounge. 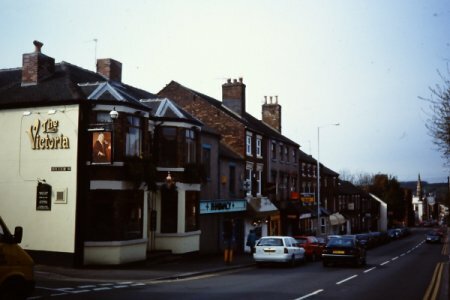 The pub at the time ran a fishing club and was popular with teachers from Wolstanton Grammar School. 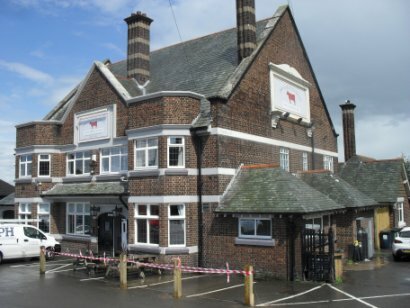 In 2012, the then-derelict pub was purchased by Shropshire-based company Caldmore Taverns and was re-opened after refurbishment.